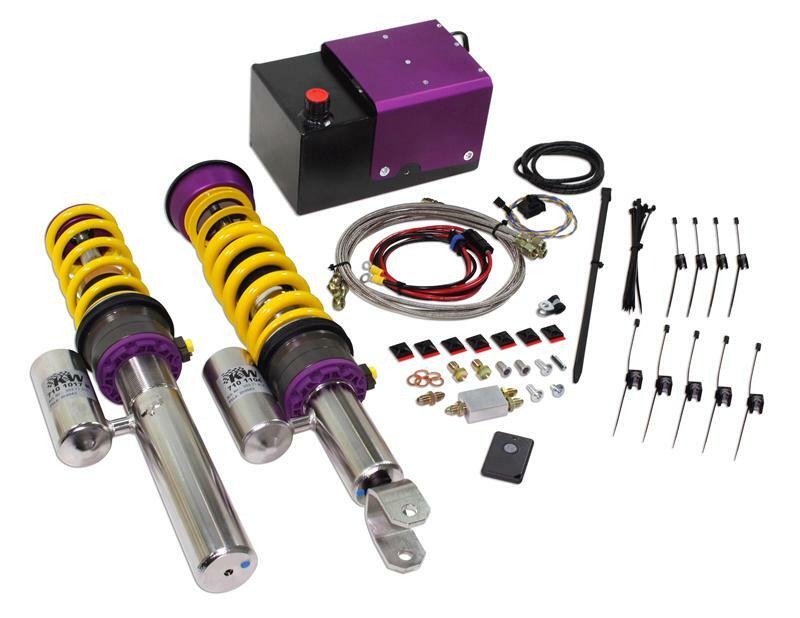 KW Suspensions Hydraulic Lift System (HLS) for Sports Cars equipped with KW coilovers provides additional road clearance for lowered vehicles. A hydraulic cylinder unit is installed between the spring perch and the main spring. When expanded, a range of 30mm to 45mm of lift is produced, thereby helping sport cars avoid road clearance difficulties. KW offers two versions of the HLS kit; HLS 2 which enables only the front axles to be lifted and lowered and the HLS 4 which covers both the front and rear axles of the vehicle. The HLS pump is installed in or near the spare tire location. Change in height is activated remotely by a small keychain transmitter avoiding the need to run additional wires through the vehicle. Height changes can be done while the vehicle is stationary or moving, up to speeds of 80km/h. When traveling speeds over 80km/h the vehicle returns to its original height to avoid any interruption in vehicle aerodynamics. The electronic unit of the HLS automatically lowers the vehicle when parked and switches to “sleep mode” to save battery life. 3. Complete KW coilover kit with HLS adapted to it.